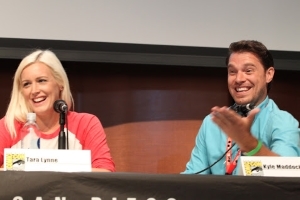 Episode 217 for the week of July 30, 2017 in which we do a recap of our time spent as press and panelists at San Diego Comic Con 2017, including dodging high speed baby strollers, trying our luck with the gumball machine, and continuing our tradition of eventful dinners at Comic Con. We are joined by Tara Lynne of the Geekiary and Ice and Fire Con and Jon (eigenvector) from the forums. 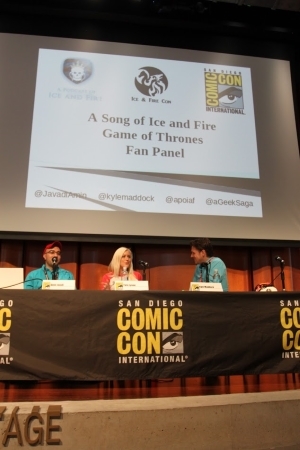 At the end of the episode (minutes in), we have the full audio recording of our third annual Ice and Fire / Game of Thrones fan panel at Comic Con. Notes: There are some audio feedback issues a couple of times in the first 6 minutes that interject Kyle’s talking, this problem is resolved after that. The panel discussion contains spoilers for all seasons of Game of Thrones and all published books of A Song of Ice and Fire. The audio and video recording is reproduced with the permission of Comic Con International. The PDF of the PowerPoint presentation. Photos from the panel will be added later, here is the wine cellar room for our final dinner. 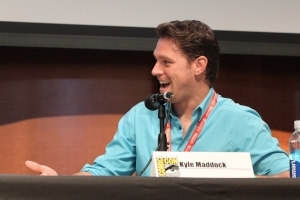 The recorded video of our panel taken by our camera crew will be shared on our Youtube channel sometime in August, check out Kyle’s King in the North video for now. The Tyrion is a chimera theory (A+T+J = Tyrion) was discussed in detail at the Supreme Court of Westeros. 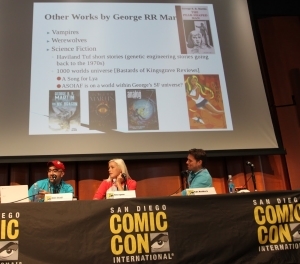 Thanks to Deb Aoki and Genese Davis for providing excellent panels each year at Comic Con. Really loved to listen to this. Thanks for the clear audio of the panel! 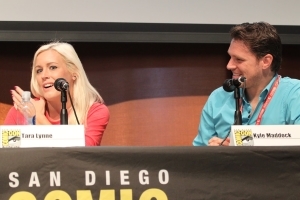 It’s always fun to do this panel down at SDCC.